A torrid week for Arsenal ended with three points after a six goal clash at Villa Park. One aspect that caught my eye this week was the difference apparent in one Arsenal player, Andrey Arshavin, so much so that it required a little more in-depth investigation. Arshavin’s poor form has been criticised of late, and not unjustly either. A goal drought extending from September, combined with poor passing, and a distinct lack of fitness has contributed to a poor season by his standards. The stereotype still persists. Arsène Wenger has unearthed many unknown talents in his time at Arsenal and has a great eye for bargains in the transfer market. Names such as Fabregas, Henry, Anelka, Vieira have gone on to become some of the world’s greatest players. One signing who didn’t was a certain Kaba Diawara, bought in January 1999 from Bordeaux for £2.5 million. The Guinean international took up the auspicious number 27 shirt, now favoured by a certain Emmanuel. Another African, Kanu, also joined the club that month from Inter Milan, though his fortunes were slightly diffrent. On joining Arsenal Kaba Diawara had already played sixty games, scoring 14 goals, since making his debut for Bordeaux in 1995 – 96. However, knowledge of the French leagues is not a skill Premier League pundits tend to excel in. At the time Wenger’s foreign internationals were seen as rather exotic, and this was another Wenger player who was an unknown, a surprise signing who for all the general public knew could have the impact of Patrick Vieira or Nicolas Anelka. Kaba made his first start in an infamous FA Cup tie against Sheffield United at Highbury. The match was a decent tie, save for the Sheffield kit, which resembled the results of the kit man’s son playing havoc with a highlighter. That ignomimious moment of dispute directly involved Diawara, in the fact that he was replaced by the protagonist, Nwankwo Kanu, also making his debut that day. Kanu set the tone for the contrast between his career and Diawara’s by grabbing the headlines, after playing a throw-in to Overmars which in the unwritten rules of sportsmanship, ought to have been played back to United, who had put the ball out for an injury. 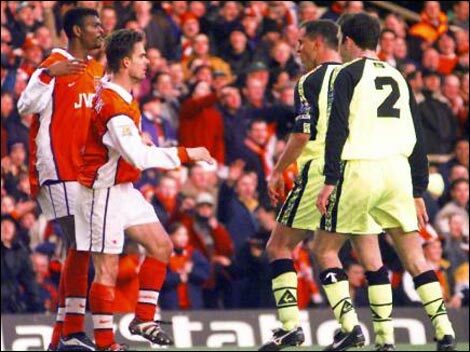 Kanu’s first actions might have been overlooked, had it not been for the fact that Overmars went on to score. The debate on the pitch turned into farce, with the Sheffield players leaving the pitch at one point, and then returning. 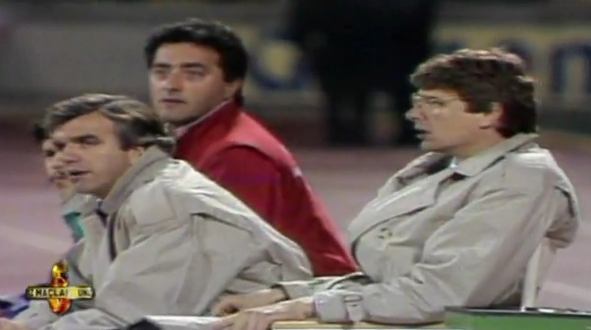 Wenger, always the diplomat, scarred by the Tapie scandal and Marseilles during his time at Monaco, offered to replay the tie after uproar, and Diawara was all but forgotten. United accepted, and Arsenal went on to win that tie 2-1, on a run that would lead to that Giggs semi-final months later. Diawara actually hit the post twice during the Sheffield game, and this form continued over his thirteen games, although ten of which were appearances from the bench. The pattern was frustrating, as Kaba often got into good positions, only to pull the ball wide, or more likely hit the post. Perhaps his confidence began to drop, but it became evident that he was not maintaining a high enough standard to warrant regular selection. The 1998/9 season ended and Diawara still hadn’t netted any goals for the Arsenal. In fact his stay was a short one, as he left the club that summer, sold for £3 million to Marseilles. The relatively short stint raised suspicions of a transfer deal with Marseilles which allowed them to sign a player whom Bordeaux would not have sold to a rival, this is unfounded speculation, but it is an interesting consideration. Diawara continued a journeyman career, playing for Marseille, Paris Saint-Germain, where he was loaned out to various clubs: Blackburn Rovers, West Ham United, Racing de Ferrol, Nice, and then sold to giants Al-Gharrafa, Al-Kharitiyath, Ajaccio, Gaziantepspor, Ankaragücü. At 33 he plays for Alki Larnaca in Cyprus after a mammoth journey around the Mediterranean. Diawara therefore manages to join the ranks of those fascinating players signed by Wenger who never fulfilled the potential he saw in them. Names such as Stephane Malz, Alberto Mendez, David Grondin or Fabian Caballero spring to mind. Read analysis of other Arsenal players such as Theo Walcott, and Andrey Arshavin in Player Scouting.